I've lived in the downtown/Midtown Miami area for about three years now and one of the major things that it has been lacking is a neighborhood bar. A place that, if needed, I could walk home from. That need has finally been met by the newly opened Democratic Republic of Beer or The DRB for short. The DRB opened about two months ago to a whirlwind of welcome. I had heard about this bar with 400 beers coming a few months before it opened but thought it was too good to be true. I'm glad my skepticism was proven wrong. I went on the opening Friday and it was a mad house (I guess I wasn't the only one looking for a bar to call my own in the area). The bar was a bit under-stocked and under-staffed that first weekend but I was going to give them the benefit of the doubt that things would get better. I'm glad I did because things turned around nicely. Since I have gone back they have had every beer I have asked for. And with 400 beers available that is quite a feat. They actually cared that the beer wasn't cold when I ordered one they had just put in the cooler and offered me a different beer and actually knew which of the beers they had were similar in style. They have even done a good job at trying to provide, as close as possible, the proper glassware for each beer as well. The DRB also has a very cool program called the passport program. You fill out an application when you come in and are entered into the program. Then every time you come in after you can pick a different beer from either a different country or from the same country and you'll earn badges that will eventually end up getting you some sort of prizes - a great reason to keep coming back and trying different beers. 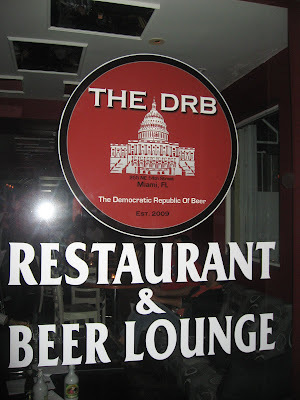 The DRB also has a full menu and, having just started opening for lunch, I stopped by to eat one day. I decided to try the beef sliders. These are one of the best sliders I have ever had. The patties are hand made with a nice bit of spice to them and served on fresh baked rolls. Excellent. I wish I could tell you how the rest of the food is but the sliders are so good I have ordered them every time I've been there since. Friends have had the chicken sliders and said they were also very good. My friend who had them said they were pretty spicy and she likes things really spicy so you may want to avoid those if you don't like spicy food. Everything else that I've seen come past me from the kitchen all looks delicious. 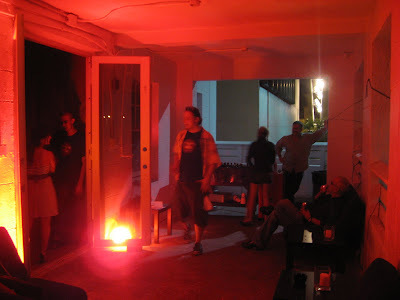 The ambiance is also one of the key features. The design of The DRB is quite modern without it being overly so and noticeable. The lighting is that perfect level between being too dark to read the menu and too bright that you think you are in a classroom. The TVs behind the bar don't give the place a sports bar feel either but you can still watch sports on the TV if you want. The music that they play is a nice mix between mellow lounge music and good upbeat hits. The newly opened upstairs balcony also gives the place a little more room on those crowded Friday nights. 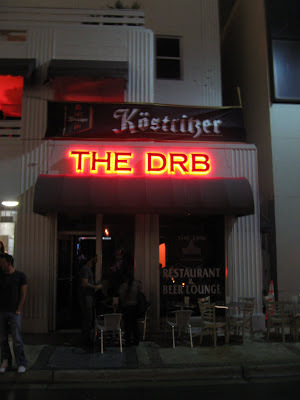 The DRB has done what few bars have been able to do by treading into being many different things and still doing it well. 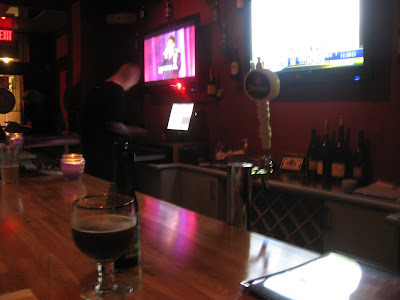 It's that local modern/sports bar with yummy, classy food and a superb beer selection. They've also thrown in a couple of macro brews for the few that will come and just want a Bud Light. I recommend you come and check it out. It could quite possibly be your new neighborhood bar as well. Yes. DRB is the bomb. I had their taco's, Mexican style. They were very good and I saw someone else having a salad and it looked delicious. I too have tried the spicy chicken sliders and they're yuummmy. I never know when I'm gonna go but everytime I do its very exciting and a good time. This is an amazing review!! Thank you!